Otterburn Mill, once a traditional woollen mill but now a major visitor attraction which boasts a shop,country coffee shop, restaurant, and visitor information centre, lies less than 20 miles from the Scottish border. 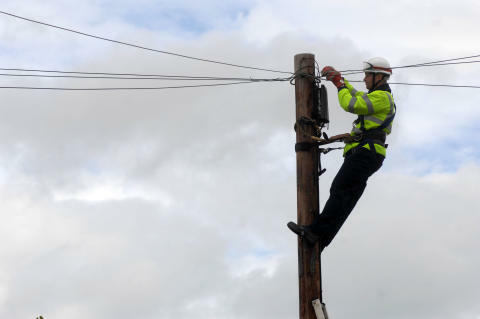 It was upgraded to superfast broadband as part of the multi-million pound iNorthumberland roll-out and now benefits from broadband speeds five times faster than before. As a result the business has been able to streamline its systems, boost its online presence and hire two new members of staff. Councillor Nick Oliver, cabinet member for corporate services at Northumberland County Council, said: "Visitor attractions like these are vital to our rural economy so it is great to see the iNorthumberland programme supporting them in this way. You can see from this example just how many different activities a company can need broadband for - the potential for it to assist businesses is really endless. "It is also good to see so many new communities across the county able to access fibre broadband - and that independent assessment has shown that more than 90 per cent of premises in Northumberland can now access speeds of 24Mbps or above." BT Group was awarded the iNorthumberland contract in April 2013. A second phase contract was signed in June 2016, with a third phase contract agreed in March last year.